Founded in 1947, the F.W. Olin Graduate School of Business at Babson College is located in the Babson Park area of Wellesley, Massachusetts, a suburb of Boston. The school offers a traditional full-time MBA program, a one-year program for those with an academic background in business, an evening MBA program for those who are fully employed, and a Blended Learning part-time MBA program. Other available options include a Master of Science in Management in Entrepreneurial Leadership program, a Master of Science in Finance, and a Certificate in Advanced Management. The business school is accredited by the Association to Advance Collegiate Schools of Business, the New England Association of Schools and Colleges and the EFMD Quality Improvement System (EQUIS). The main campus of Babson College is situated approximately 14 miles from the city of Boston in Wellesley, Massachusetts. The school also maintains centers in Boston, San Francisco, Miami, and Dubai. 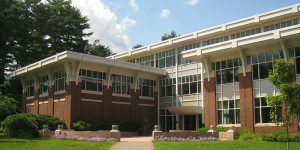 Babson’s main campus can be found in proximity to Exits 14 and 15 on the Massachusetts Turnpike and then Route 16 towards Newton/Wellesley. The main campus of Babson College is located less than 20 miles away from Boston’s Logan International Airport. Olin is located on the northern edge of Babson’s campus. Students of the graduate school complete most of their classes in Olin Hall, a building that includes rooms for group study, a café and spaces for student clubs and events. MBA students may also take advantage of Babson’s centers and research institutes, fitness center, cafeteria, and student center as well as the Horn Library, which features research support and computer services for the Babson community. Babson currently employs more than 160 full-time faculty members and 75 part-time faculty. Eighty-seven percent of all full-time Babson faculty members hold a doctorate or an equivalent degree. All programs offered by the Olin School of Business are taught based on the school’s hallmark entrepreneurial and action-oriented approach to learning. The F.W. Olin Graduate School of Business at Babson MBA program currently enrolls 574 total graduate students across the four degree tracks. Olin offers a two-year full-time MBA program, a one-year program, a two-year program, and part-time programs for evening and blended learning students.